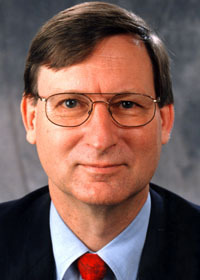 Hal Varian, Google's chief economist, and emeritus professor at UC Berkeley. Varian's lecture, “Predicting the Present with Google Trends,” will take place October 20, 2011 at 2 p.m. in the Alumni Room of University Center on the UCSC campus. It is free and open to the public. Varian will show how search queries from Google can help improve forecasts of the current level of activity for many different economic events, including automobile sales, home sales, retail sales, and travel behavior. He is an emeritus professor in the School of Information, the Haas School of Business, and UC Berkeley's Economics Department. Varian is also a fellow of the Guggenheim Foundation, the Econometric Society, and the American Academy of Arts and Sciences, and has published numerous articles on economic theory, industrial organization, financial economics, and information economics. Varian's talk is the first public event by the Sury Initiative for Global Finance and International Risk Management (SIGFIRM), a new interdisciplinary initiative at UC Santa Cruz that addresses challenges in global financial markets brought by increased uncertainty, globalization, and the use of information technology. The initiative was founded with a seed grant by Sharath Sury, a UCSC economics graduate who later became a successful money manager. The lecture series is organized by Thomas Wu, an assistant professor of economics at UCSC. Each quarter, SIGFIRM will invite a leading figure who has contributed to the fields of economics and finance both as a researcher and a practitioner to deliver a public lecture on a topic of major significance to students, faculty, and professionals. SIGFIRM co-directors are Manda Sury, a respected researcher in computational finance and an active financial trading firm manager, and UCSC economics professor Nirvikar Singh, an expert on the Indian economy and other emerging markets who also serves on the Indian Finance Minister's advisory group on G20 matters. According to the co-directors, the series will contribute to SIGFIRM’s goal of bringing together researchers, practitioners, and policymakers to solve real-world problems of finance. These include risk management, the need for robust tools for financial decision-making, and policymaking in a globalized financial system. The scheduled speaker for winter quarter is Terrance Odean, the Rudd Family Foundation Professor of Finance at the Haas School of Business at UC Berkeley.